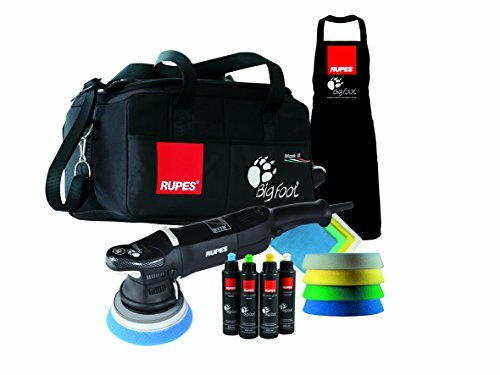 The Rupes LHR 15 Mark II Big Foot Random Orbital Polisher Deluxe Kit is an all-inclusive polisher kit that contains everything you need to remove swirls, scratches, water spots and anything else than hinders the shine of your vehicle's paint. What Can This Package Do? • Time Saving Up To 40% - The new Mark II Big Foot polisher is an amazing tool that enables you to obtain excellent results in no time. LESS steps, LESS time, LESS compound consumption and GREATER profits. • 40% Energy Saving - Thanks to their design and technology, the new random orbital polishers by Rupes are more energy efficient as compared to traditional polishers. • No Holograms - Holograms are micro scratches made by traditional polishers: the new random orbital polishers don't leave holograms and enable excellent results in a single step. • Easy To Use - Polishing has always been considered an operation that requires experience and skill. Inexperience may in fact result in surfaces being damaged and in the exposure of edges and sharp corners. RUPES has eliminated these risks with its new random orbital polisher that enables even less experienced operators to achieve professional results. • Superior Finish - The goal of operators has always been achieving two results: gloss and color depth. In designing its polishers, Rupes has taken these requirements into account to allow operators to achieve unique and extraordinary results. • Maximum Control - Rupes polishers stand out because of their accuracy and easiness of use, which enable to obtain high quality results with less fatigue. • Larger Contact Area - The new Rupes random orbital polishers enable to use the whole surface of the buffer. When using traditional rotary polishers , it is necessary to maintain the buffer inclined as compared to the work surface due to the high temperatures that develop on the machined panel, which reduces the useful surface of the buffer to 40 %. The new Mark II Big Foot polisher is an amazing tool that enables you to obtain excellent results in no time. Thanks to their design and technology, the new random orbital polishers by Rupes are more energy efficient as compared to traditional polishers. Polishing has always been considered an operation that requires experience and skill. Rupes polishers stand out because of their accuracy and easiness of use, which enable to obtain high quality results with less fatigue. The new Rupes random orbital polishers enable to use the whole surface of the buffer.